These are the authentic and prefect shoes for your Maiko ensemble. 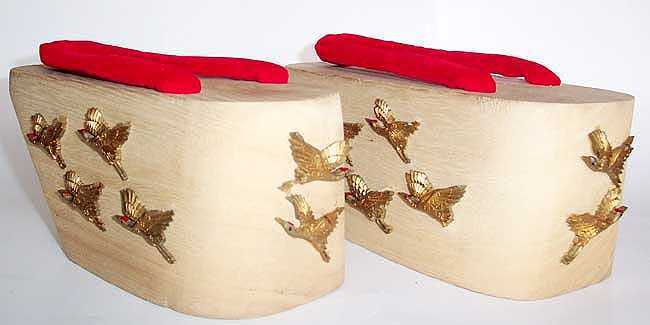 The Pokkari are made of solid Paulownia wood and decorated with ornate golden cranes. The birds have delicate painted details, which adds to the elegant appearance. . The traditional bells is built in the under portion of the shoe. The straps are made of soft rope covered in red velvet. Pokkari dimensions: 9 inches long heel to toe x 3 inches wide at widest part and 3.5 inches high..